I've been a fan of SpellingCity.com for quite some time now and I was fascinated when I heard they had produced a free app. 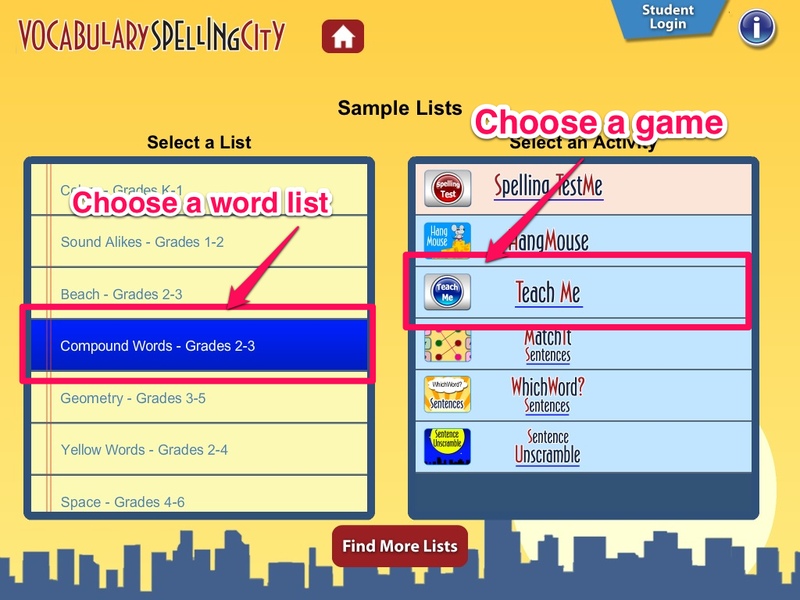 For those of you who don't know about SpellingCity, the website enables learners or teachers to enter a word list and then automatically generate a range of interactive multimedia activities based around the words. The site automatically adds audio recordings of the words and example sentences to the activities it generates. There is a great range of activities that students can do within the site and they can generate certificates for their teacher or parent to prove they have done their homework. Spelling TestMe - In the activity students have to spell out the words from the word list. To do this they hear the word in isolation and then again in the context of a sentence. They then type the word into a field. At the end of the activity they find out how many of the words they spelled correctly. If they got any of the words wrong they can go to the 'Teach ME' activity which spells the word for them using audio and text and gives them an example sentence containing the word. 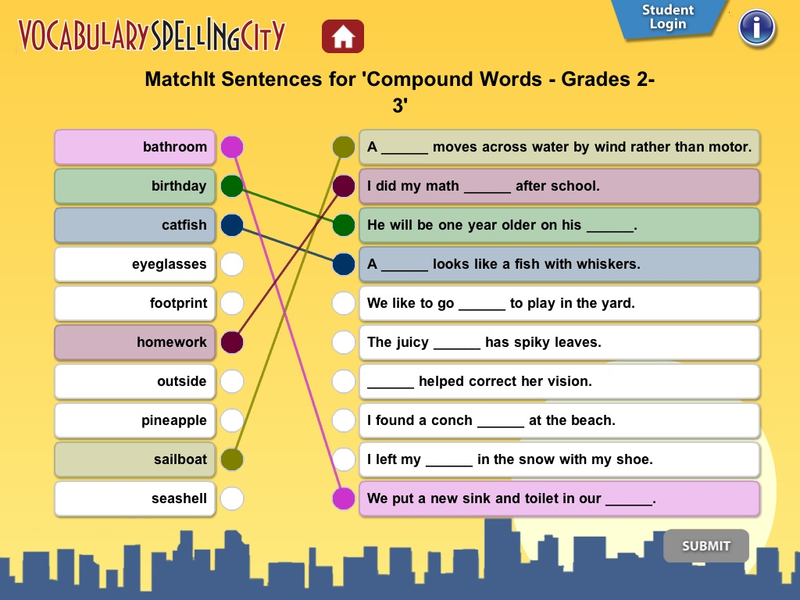 The MatchIt activity tests the students understanding of the words by getting them to put the words into gapped sentences. Again the students don't get feedback until they have finished the activity, so this reduces the tendency to randomly try to guess. Which Word is a multiple choice type activity and students have to choose the correct word to complete the gap in a missing sentence. 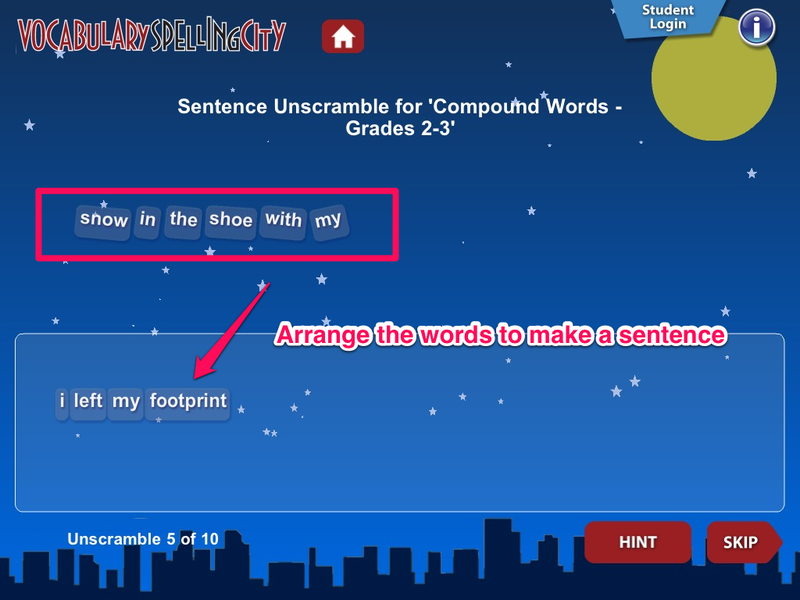 The Sentence Unscramble activity tests students understanding of syntax, by getting them to arrange the words from the sample sentences into the correct order. The students can get an audio hint on this activity if they are stuck. My favourite of the activities though, and the one that is most popular with my students is the Hang Mouse activity. 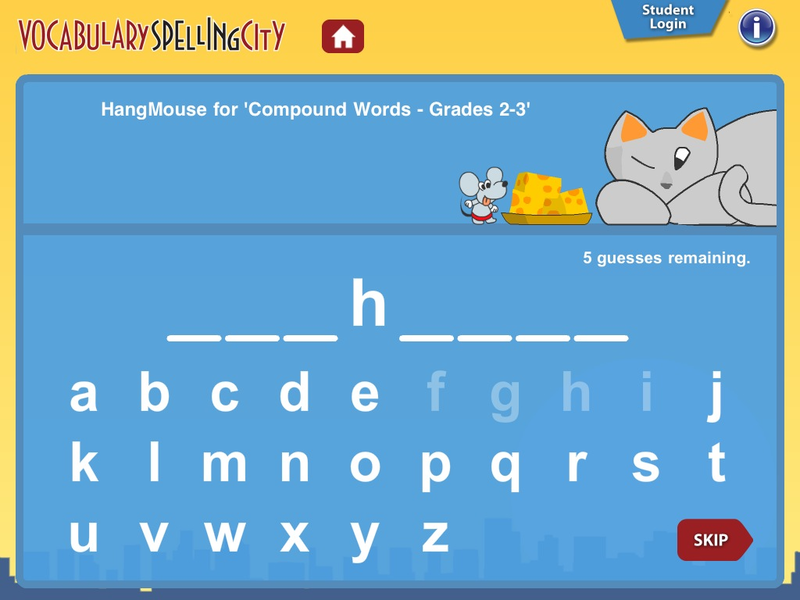 This is SpellingCity's own variation on the hangman game. Students try to guess the letters that spell out words and each time they guess, the mouse runs to tab some cheese. Each time they guess incorrectly, the cat starts to wake up, and if they get too many wrong letters the mouse gets trapped. As you can probably tell, the app is aimed very much at the younger end of the learner market though the word lists do go up to grades 10 - 12. 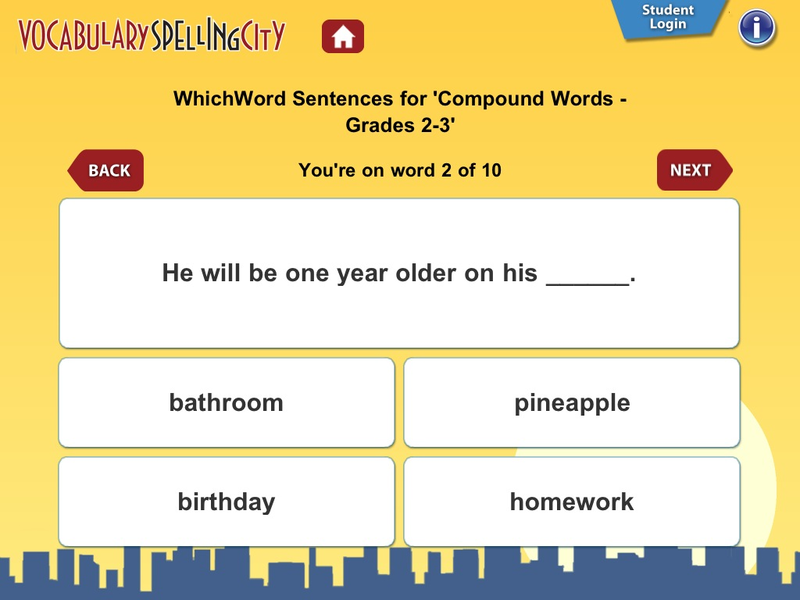 To get the best from the app you really have to have a SpellingCity account as this enables you to import your own word lists and to manage and track your learners' scores. That said, you can create a basic account for free. 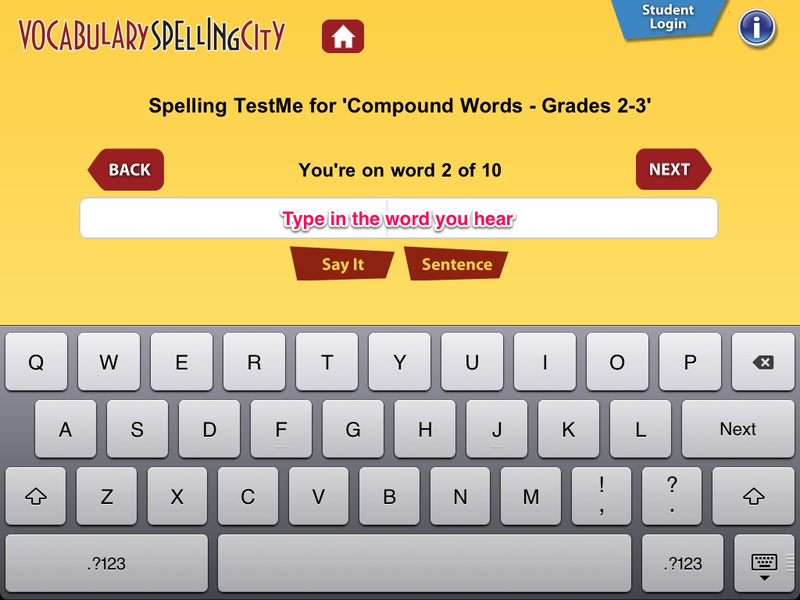 On the whole the Vocabulary SpellingCity isn't going to cause an educational revolution, but it is a good simple app which does what it sets out to do in a user friendly, engaging and intuitive way, so if your students' spelling and vocabulary needs some work then why not get them using it. Sadly there's no Android version available at the moment. If you have used the SpellingCity app or something similar I would love to hear your comments and suggestions. This post was sponsored by RM Education Shop a great place to buy all your educational technology hardware. One of my favourite ways of helping students with the difference in use between 'present perfect' and 'past simple' forms is a simple but effective activity called lies and truth. I've been married 3 times. Then get your students to ask you for background information about them to find out which are true. The students should use past simple to get the details. Once the students find out about me they pair up and interview each other using the same format. This is a simple but engaging activity that I find students really enjoy it and get a lot of speaking practice from it. I think this is a great way to get students developing their listening and speaking skills and something that they can engage with outside of the classroom. The language being used is very authentic, so it might be a struggle for lower levels, but for higher levels it should be appropriately challenging and give them some real exposure to authentic English. This looks like a great way to get students developing the listening and spoken fluency outside of the classroom in an enjoyable and competitive (there is a leaderboard) way. The site might not be appropriate for younger or lower level learners though, but you could pre-sellect some specific videos that you could use in class as a way to get your students practicing the same activity in class. I hope you and your students enjoy BluffBust and it helps them to develop their speaking and listening skills.